I thought I had found all my high school drawings of Dahmer. But two weeks ago, while cleaning out my Mom's basement, I pulled a box from under the stairs, one that was buried beneath a pile of other things. The box was full of old sketchbooks and drawings from high school. And as I leafed through these things, the hair stood up on the back of my neck again. Sure enough, there were several drawings of my old pal Jeff. 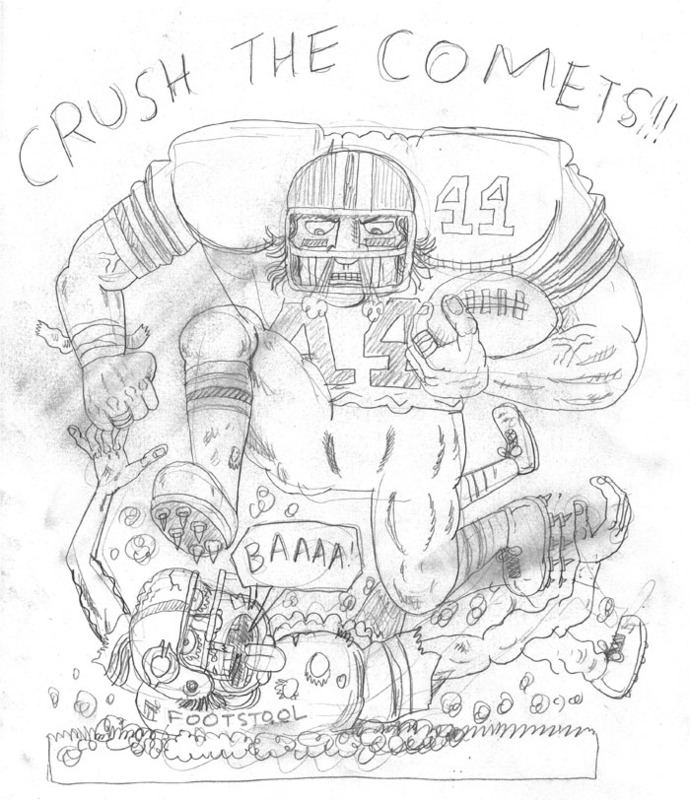 The above drawing is a preliminary sketch for one of the many football posters I drew during my senior year. A cheerleader came up to me in the art room one day and asked me to draw a poster for the upcoming game, one that would be hung at the main entrance to to school to "inspire" the players as they trudged in from the bus in the morning. Stunned that the cheerleader even knew my name, I agreed. That day after school, I created a 6-foot high poster with marker, rolling out the paper in the hallway outside the art room. It proved to be so popular with my fellow students, I was dragooned into drawing one before EVERY game for the entire season. The poster above is from halfway through the season. That's our "star" running back trampling a hapless opponent, who is, of course, Dahmer, yelling out his trademark bleat. Jeff usually lurked around school after hours, as I detail in the book. Mostly to drink in the woods near the school, but also to hang out with various members of the Dahmer Fan Club. 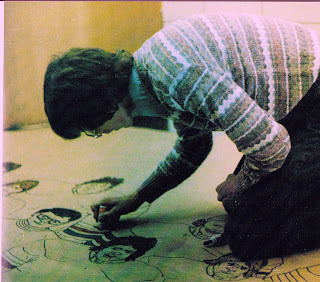 I spent HOURS on these stupid posters and Dahmer often kept me company as I drew in the hallway. As the self-appointed Minister of Propaganda for the Fan Club, I was inserting my cartoon Dahmer into almost everything I drew: cartoons for the school paper and yearbook, student council posters etc. So naturally, I put him in these football posters, too. The name "Footstool" on the back of his jersey is another related inside joke. Dahmer imitated his Mom's interior decorator, who suffered from cerebral palsy, as part of his bizarre spaz schtick. Jeff often joked that the only thing this guy added to the decor was one solitary footstool. Thus the jersey name. Outside of the Fan Club, no one else in school got the inside gags. That was typical. We were simply amusing each other. But now, years later, these goofball drawings have a re-defined, utterly sinister, meaning. In the case of this drawing? "Crush the Comets"... that was the Coventry High Comets. Coventry is where Steven Hicks, Dahmer's first victim, lived. Look for some other recently discovered drawings in future posts.